Yesterday was quite the marathon baking day! 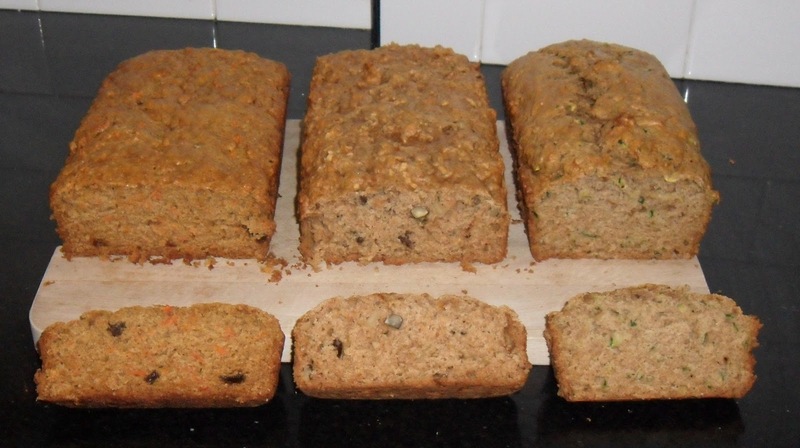 Three loaves, all with similar bases and different fruit/vegetable add-ins. At Cherryvale Farms, we have a commitment to delivering delicious, easy to make mixes that are also healthy, hence your addition of a fresh fruit or vegetable. In the case of our “Everything But The…Zucchini / Apple Cinnamon / Carrot Raisin” bread mixes, the main add-in is the fresh ingredients you yourself supply. No gummy, rubberized, dried-out fruit or veggie bits in our mixes! No! You’re in charge of making the mixes wholesome for your family – we just provide the vehicle to do that. To learn more about what I’m talking about, check out this link for a NY Daily News story on fake blueberries in processed foods. Those little blueberries you thought you were eating in your breakfast cereal or muffin may not be blueberries at all! They might be oil, dyes and gums made to look like blueberries. Ew! I don’t know about you, but that grosses me out. Here’s a look at my “Everything But The” Carrot Raisin Bread, Apple Cinnamon Bread and Zucchini Bread (from left to right). Some more fine-tuning and we’ll be well on our way to packaging. YAY.